This is an excerpt from Everyday UX, on sale today from UX Mastery. What's on your desk? We asked several prominent UX Designers to share their favourite tools of the trade. Ruth Ellison, User Experience Designer at Stamford Interactive. 1) Mini Moleskine notebook 2) Evernote Smart Notebook by Moleskine 3) Accessibility Attitude Adjuster cards by Stamford Interactive, 4) Accessibility simulation paper glasses, 5) Google Nexus 4 phone, 6) Lilac Post-It notes, 7) Sugru self-setting rubber, 8) Stabilo yellow highlighter, black fine point Sharpie, red Sharpie, Prismacolor grey markers, 9) Ruth's handmade white chocolate (theobromine) Crankybot jewellery, 10) Lego custom-made minifig, 11) Tin robot. Ruth: This sounds a bit old school, but I really love pencil, and paper and post-it notes. I love to scribble. I also love things like sketchbooks and markers, because they help highlight things. One of my preferred digital tools at the moment is Optimal Workshop, a terrific suite of research and testing and question tools that you can use both face to face and remotely. Sarah Bloomer, Principal of Sarah Bloomer & Co, a Boston-based design research, strategy and training consultancy. Sarah: My regular tools are collaboration, facilitation, paper and pencils. Oh, and sticky notes. I’m also a believer in being a good listener and observer. We do a lot of customer research to inform our design. We keep the design fluid and sketchy before committing anything to a polished look and feel. Collaboration, facilitation, paper and sticky notes are handy when coaching, teaching and just plain thinking. Stories are the secret to good experience design. In fact, it’s the first tool a designer should use to think about the design problem. I’ve used stories, or “user narratives”, since the early 90’s to describe a persona doing a series of activities within a specific context. It’s a powerful, efficient way to think about the experience you want to create, and to communicate that experience. Ben Tollady, Founder and UX Director of Melbourne-based user experience design agency, Thirst Studios. 1) Dotgrid.co graphpaper sketchpad 2) Premium A4 writing pad (grid lined), 3) 15” Macbook Pro, 4) Sennheiser headphones, 5) Responsive Web Design by Ethan Marcotte and Designing for Emotion by Aaron Walter, 6) Reading glasses, 7) Staedtler Mars Fineline mechanical pencil, blue Mitsubishi Uniball UB157 pen, black Mitsubishi Uniball UB157 pen, Light blue Pantone art pen, Fine point Sharpie marker, Staedtler eraser, 8) Apple iPhone 5 32MB, 9) Flip camera, 10) R2D2 figurine. Ben: Paper, pencil and a Sharpie are my favourite tools. I find sketching to be the fastest, easiest and most tactile way to get ideas out of my head and to start working out solutions for design problems. We also use a whiteboard a fair bit for thrashing out ideas and approaches to certain problems. We use OmniGraffle for wireframes, and Photoshop for all of our user interface design—I use those tools on an almost daily basis. We’re also using Zurb’s products, mostly Notable, which is a great tool for sharing designs and gathering feedback from clients. The more regular applications we use are Word, Dropbox, Basecamp and Harvest. For reminders, I use Apple’s Reminders—if it isn’t written down I completely forget to do it so I have to keep making long to-do lists. 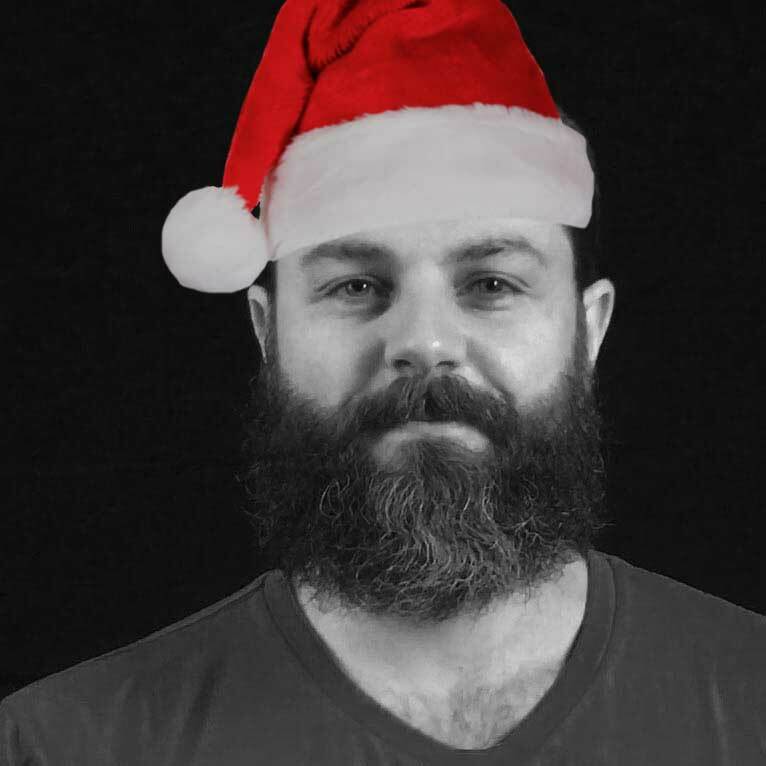 General tinkerer, web tailor, user-centred design soldier and tall-ship sailor, Luke Chambers is a proud co-founder and Producer of this here UXmas.com, and also of UX Mastery, an online training resource with tips, tools and training for aspiring UX designers. Throughout his day he listens, sketches, tells stories and explains to people the 'why' of the design that happens behind the visuals.